This dainty floral print fabric from the Flower Bouquet collection by Lecien is just my type. Lecien has a ruler on their site and it looks like the larger flowers are about 1/2" wide--as long as the ruler is metric (and I think it is). If not, they are about 1" wide. Either way this wildflower inspired print is darling! Look what's finally ready to sew! Haha...these patterns can take a while and this one took some extra time because it shows not one, but two different patchwork layouts and also includes all the measurements for the pieces in both Imperial and Metric. Anyway, I think I grew some new brain cells putting this one together, but the pouches turn out so nice and the pattern itself looks fantastic! The instruction photos are bright and colorful and have white backgrounds to conserve your ink. Two Sizes - Size 1 is oriented horizontally and Size 2 is oriented vertically. These are well padded and have 4 layers of batting/muslin/fabric. Both fit glasses up to 5.75" wide x 2" high x 1.5" deep (146mm x 51mm x 38mm). The width and height measurements refer to the frame front and the depth is the height from back to front when they are closed. Size 1 will hold a phone up to 5.5" high x 2 5/8" wide. 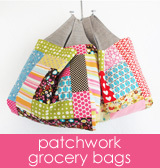 Includes patchwork layouts for both sizes. Comes with dimensions for all the patches. You can also skip the patchwork if it's not your thing! 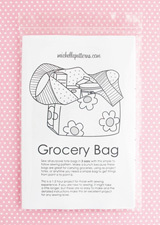 There are also some new scrap bags available. Sold out, but watch this section for more scrap bags. There are two bags of the "tiny scraps". The one pictured above is here and a second bag is here. One (1) ounce bag of some of the larger quilting cotton scraps can be found here. Two remnant pieces of a print from Tokyo Milk's Neptune and the Mermaid collection are available here. I were more of a flashy dresser, I would use these pieces to make embellished jeans like these beauties (don't bother clicking the pin--it doesn't go anywhere). 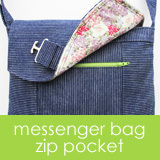 Finally, one new bag of denim fabric pieces can be found here.